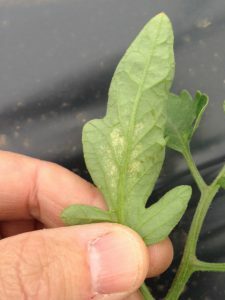 Mites and feeding signs on lower leaf surface. Aphids also present. Two-spotted spider mite (TSSM) infestations have recently been discovered in high tunnels. TSSM feeding results in small white pin-spots on the upper leaf surface (see photos). Mites are actually underneath leaves. These pests can increase dramatically in the warm, dry environment of the tunnel. Check 5 plants each in 5 separate locations in the tunnel. Inspect the entire plant, and be sure to check the underside of leaves that display the whitish mite feeding. If mites are found, it is best to immediately treat. TSSM is much more easily managed, when the problem is addressed at low levels. If allowed to spread throughout the tunnel, TSSM will be much more difficult to control. See the 2016 Commercial Vegetable Production Recommendations – Pest Management section for materials that are labeled for use in greenhouse structures, including those that are OMRI approved. Mite feeding signs on upper tomato leaf surface. It may be possible to deploy predatory mites such as Neoseiuilus falacis or Neoseiulus californicus in the tunnel to limit TSSM populations. This and other TSSM predators may be purchased from bio-control suppliers such as Koppert. The main drawback of this strategy is that predatory mites generally have lower tolerance for heat than TSSM. Therefore, if outside weather is routinely exceeding 80°F, and the tunnel temperature is exceeding 85°F during the day, it is unlikely that predatory mites will survive long enough to have a significant impact on TSSM. 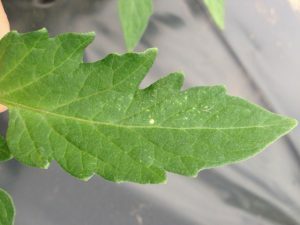 Additionally, it is helpful for the dispersal of predatory mites if the leaves of adjacent tomato plants are touching. Aphid populations may also begin to appear both in high tunnel tomatoes. These pests often form colonies beneath the surface of leaves and near growing points on the plant. While the plants consist primarily of vegetative growth without fruit, aphids are largely an insignificant pest. If no broad spectrum insecticides are used on the plants, the aphids generally are decimated by predators and parasites before becoming an economic problem. Should aphid populations increase to a degree that their droppings are accumulating on the surface of developing fruit, an insecticide that specifically targets these pests may be necessary. See the 2016 Commercial Vegetable Production Recommendations for materials that are labeled for aphid control in tomatoes. Avoid broad spectrum insecticide classes such as synthetic pyrethroids as much as possible. A few European corn borer (ECB) adults were captured in blacklight traps this week. Numbers are very low, with few traps recording catches.